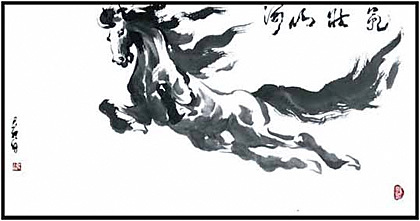 This painting is the signature pose of the Yeh family single Celestial Horse composition - his imposing presence inspires awe as he soars through the sky with earth shaking power. All paintings of the Yeh family�s Celestial Horses emphasize �Chi�, the General�s spiritual strength for righteousness and justice. It is an invigorating energy that travels from the horse�s eye to the mane to the tail. Every line, every stroke, every muscle, every hair is filled with this �Chi�. This is why it is so difficult to imitate the Yeh�s Celestial Horse. In order to reach this state, the painter must constantly purify his mind and cultivate his painting integrity. Artist Yeh Fei Pai will present a demonstration of brushpainting on March 11th from 12-1pm (food will be provided.). Following this, the artist will be formally recognized in front of City Council. 200 E. Santa Clara Street, San Jose. For more information, contact District 4 Council office at 408-535-4904. This page contains a single entry from March 9, 2008 5:53 PM. The previous post in this blog was 100/100 Fundraiser for Backwater Arts. The next post in this blog is Eric Taggart-an ArtSeen Emerging Artist.